Licensing Authorities: Malta Gaming Authority, UK Gambling Commission, Alderney Gambling Control Commission. From the industry's leading live dealer software providers, Evolution Gaming, Blackjack Party is a unique, fun to play a low stake card game. What makes this variant to stand out from others is the fact that it features two live dealers. Blackjack Party is one of its kind. You will enjoy watching the two dealers as they communicate with each other, respond to players' questions sent through the live chat, crack jokes, and much more. Additionally, the video quality is fully optimized to automatically change(Low, Medium, High or HD) depending on the speed of your internet. Evolution Gaming has used all means possible to bring you the thrill and social aspect of a real brick and mortar casino. A standard live Blackjack game has a maximum of seven seats per table. Nonetheless, Live Blackjack Party allows players to bet from behind. Meaning you can make the party better by inviting your buddies to join even if all the seats are taken. 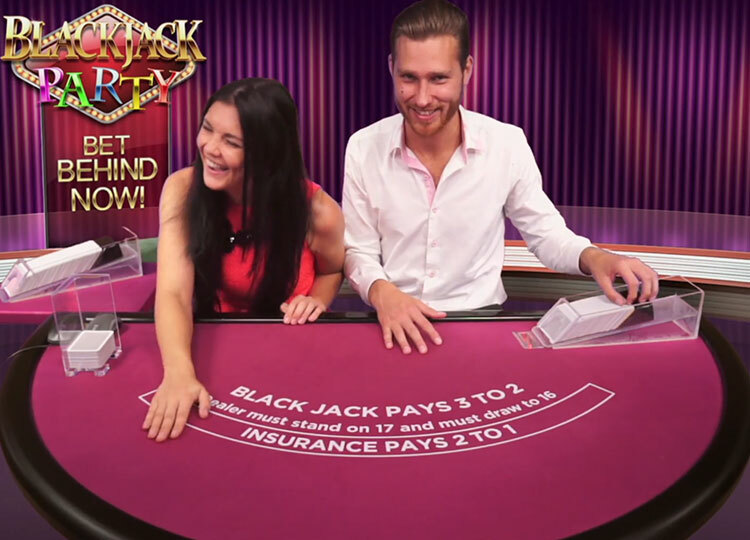 With Blackjack Party, the more the number of players, the more fun you experience. Imagine playing at a table where everyone is talking, laughing, tipping, celebrating the outcome all from the comfort of your home. That's what Blackjack Party is about! Playing Blackjack Party is simple and straightforward, regardless, you are a rookie or experienced blackjack player. The standard rule of the game applies: to make a hand as close to 21 as possible but not exceed it. As well the game uses the standard 52 card decks where the dealer stands on all 17s. To access all the rules of the game, click on the question mark (?) button. You will be given a stack of betting chips with varying values. The dealers in Blackjack Party are not only professionals but also charismatic, engaging, and friendly. The insurance bet is only offered if the dealer's face-up card is A. The exciting thing about this game is that you can bet on the cards dealt with other players. You will share the results of the other player's hand as well as the payouts. This explains why it is essential to bet behind an experienced Blackjack player. There are a 'Hot Player' icons showing a breakdown of the player's performance such as the number of consecutive games that have been won. Perfect Pairs - the bet wins if the initial card dealt with the player has two cards of the same suit, for instance, a colored pair, mixed pair, and perfect pair. The highest payout for this side bet is 25:1. 21+3 - The bet will win if the player's first two cards and the dealer's face-up card form a possible winning combination. Insurance Bet - this bet can be used if the dealer's face up card is an Ace and it pays even. Pre-Decision Bet - This bet will allow the player to stand, split, double down, or hit after the first two cards have been dealt. A player who fails to choose a bet within the allocated time is considered to Stand. As is with most Evolution Gaming's games, Blackjack Party is playable across different devices such as Android, iOS, and Windows. This is an advantage to players who like the fun of a real casino on the go. The graphics and sound effects are optimized to fit on small screen devices while maintaining smooth gameplay. Evolution Gaming knows how to get the player's attention. They have utilized high-quality graphics and a sleek interface to provide you with the best gaming experience. 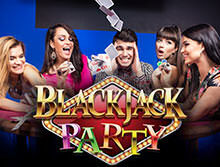 Blackjack Party is the best choice for both players with small and huge budgets.